In this article titled Horse Culture, we don’t talk about equestrian culture: classical riding, saddle, bit, spur, western riding, ricreative riding, history of equitation, horsemanship, natural horsemanship or other disciplines. In this article we talk about the horse and hìs culture. 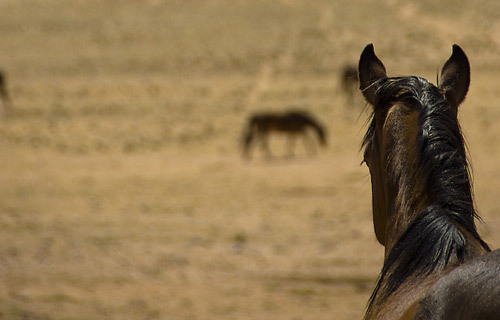 In the wild, horses live in a social context. Or better, they live their every day life in a social experience and learning context. As has been observed in other species, also in a horse bands there is a cultural transmission, in which every horse learns from the other. Knowing eachother, especially in a family group, makes it possible for a horse to read the details in what another horse is doing, being able to pick up on it’s intentions and learn and create a shared culture, by watching and by doing. It is interesting when a young horse learns from observing an adult experienced horse, but it is even more interesting when horses share an experience and learn together from and with each other. Most horses in our society do not have family connections. Their social experience and learning context can be stimulated by helping them share experiences. Two young horses for example: A one year old Welsh Cob and a two year old Haflinger/Quarter living together since several months. Facilitating them in the exploration of a novel object, they initially show different timing and different ways in approaching. The Haflinger/Quarter uses more his hoofs and the Welsh Cob more his mouth, but after some moments they begin to explore together in the same way. The Haflinger/Quarter also with his mouth and the Welsh Cob also with the hoofs. In that moment together, they share their own exploring intents and enrich eachother by experimenting alternatives, creating their own exploring culture. It is not that one is better than the other in exploring, but simply different. The more important aspect is that they both learn by watching the other. And more: Horses that live in an anthropic dimension, that live near human, can learn watching human. Horses watch us, probably more than we watch horses. They learn through human and they create their own idea about human. Social learning is cognitive learning and cognitive learning improves welfare and wellness. The important field of cognitive ethology is mainly related with paradigms regarding perception, learning, categorization, memory, spatial cognition, numerosity, communication, language, social cognition, theory of mind, causal reasoning, and metacognition. Questions about animal awareness and consciousness are just one corner of a more general set of questions about animal cognition and mind. The so-called “cognitive revolution” that took place during the latter half of the 20th century has already led to many innovative research-experiments by comparative psychologists and ethologists probing the cognitive capacities of animals. The way of cognitive ethology will revolutionize with ever more power our relationship with animals, especially the horse-human relationship. In classical equestrian world, but also ‘natural horsemanship’ world, ‘clicker training’ world and even the ‘coaching with horses’ world, the animal and also horse-human relationship is still very much defined from a mechanical and behaviouristic point of view. Interaction between horse and human is continuously defined focussing on the behavior we desire from the horse. Most animals might not stimulate the cognitive interest of human, but at least in their living with humans are more or less left in their own environment. The horse instead almost never lives in an own social environment and their interaction with human is one with continuous expectations. Horse life is scheduled into phases in which it is pre-defined what it should learn in which moment: handling, haltering, walking, having a saddle. We very precisely define what and when it should learn things, without showing resistance or own initiatives, to respond to our requirements. So what does this cultural new vision mean, not mechanical and behaviouristic? How is it possible in horse-human relationship? 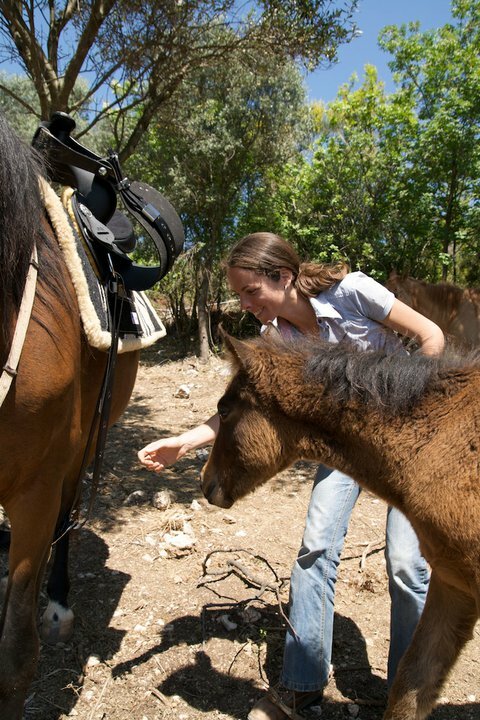 What must we change about our activities with the horses? What impact will it have? 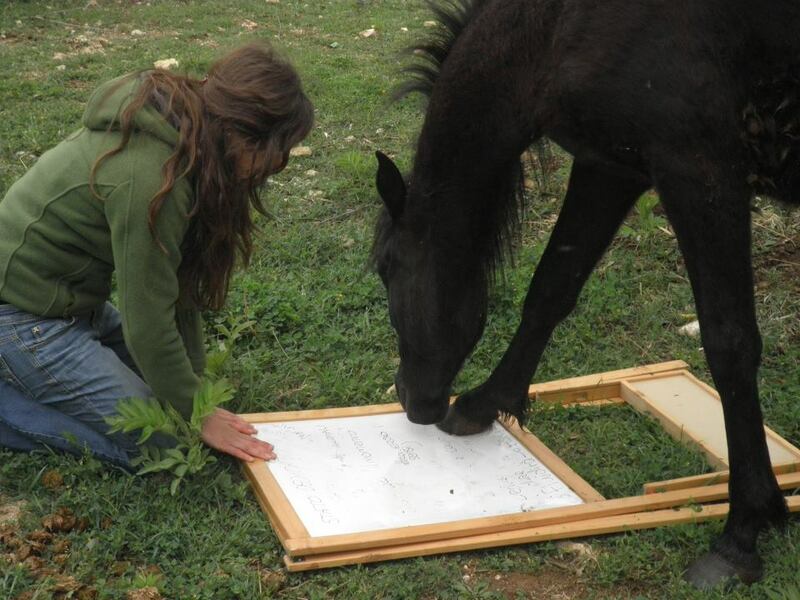 A horse has the capacity and the need to develope his cognition. To understand the world he is living in. Smell it, see it, listen to it, explore it, investigate it. And who are we to decide for the horse if he can or cannot do so? Create space and time for the horse to explore his environment. Decentare yourself in the interaction with the horse. One of the caracteristics of cognitive learning is the latency. Often you cannot see the immediate result of the learning process. What was elaborated might be used in a future moment, if necessary, and when the circumstance call it. In the cognitive-relationship approach, based on zooanthropological philosophy, it is not interesting what the horse learn, but how it lives the experience together with other horses and/or with human. In fact one of most important aspects in applied equine cognitive ethology is the learning path, not the learning results. It changes practically everything. But it will bring back a horse free of tension. A horse that is able to elaborate his environment and cope with changes in it. It creates the possibility to have an ethical and sound horse human-relationship, in which both are able and free to express themselves. Behavioural Control Techniques reduce quality of life in animals. Horse Memory: what have you (human) done for me lately?